Thousands of WordPress pages contain embedded Google Drive files and folders thanks to our Google Drive Embedder plugin. 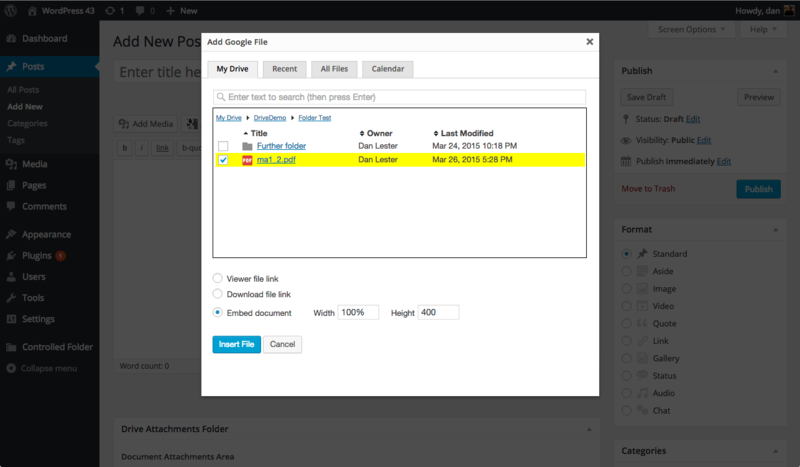 It’s easy to embed a file: when composing a post in WordPress, click our ‘Add Google File’ button to bring up a dialog box where you can search for the file or folder you want. That works well if you know how to search for the Drive file, but if you only know which folder it is in, it can be harder to find. Many users have asked for a user interface similar to ‘My Drive’ on Google Drive itself, and the latest releases of the Premium and Enterprise versions of Google Drive Embedder now contain this improved browse capability. Starting from the top level ‘My Drive’ you can see your root files and folders. You can select one of them to embed directly, or you can click into one of the folders to see the files within it. You can also click a file to see a preview of its contents without losing your place in the hierarchy. Other tabs allow you to view all recently used files, or just ‘all files’ available to your Google account. If you are already a Premium or Enterprise customer, you should see the upgrade to version 3.7.1 appear in your Plugins page. If not, you can purchase a Premium or Enterprise license on our web site.